31st January 2011. Transfer Deadline Day. This was one of the most frantic days in football. It became the most expensive day of all January football transfers. My club Liverpool were forced to lose one of their prized possessions in Fernando Torres. The Spanish international submitted a transfer request last week and showed his intention of leaving the club. He left the club for a fee of £50million to Chelsea. This left Liverpool with little time to act fast and to replace the one time Anfield great. Liverpool manager Kenny Dalglish worked very hard in managing to buy two great strikers within hours. Firstly the deal for Uruguayan international and Ajax forward, Luis Suarez was completed for £22.8million. 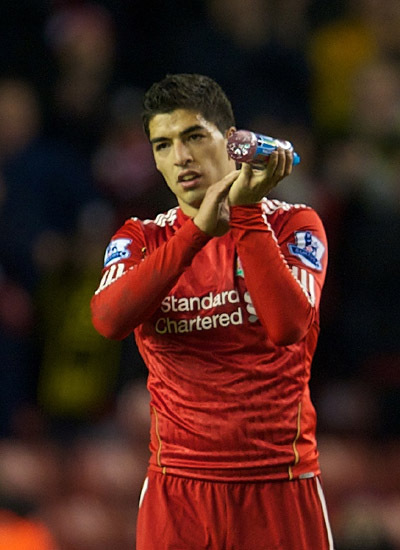 I feel Suarez will become an Anfield great and score many goals for the club. The 24 year-old scored on his debut yesterday against Stoke City. I feel this will be the begininning of many goals for Luis. Also hours before the 11pm deadline on Monday, the former Newcastle forward, Andy Carroll signed for the club for a fee of £35million. Most people are saying this is an excessive amount, but I feel a deal that is made on deadline day will always be overpriced. Also I feel his potential will be worth that and think we have bought potentially a world class England centre forward. Carroll was paraded to the fans at Anfield yesterday, and received a standing ovation, in the 2-0 win over Stoke City. Therefore, I feel there is life after Fernando Torres and think Liverpool will grow stronger with the signings of Luis Suarez and Andy Carroll. I cannot deny that I am gutted that Torres decided to leave and I will always regard him as a world class striker. However I feel we can grow stronger with Suarez and Carroll and push higher up the Premier League table and maybe even gain a European place. The past 24 hours have been very lively in Liverpool, as the club announced it has agreed to sell to New England Sports Ventures (NESV). The company, headed by John W Henry, are current owners of the American baseball team the Boston Red Sox. The deal is reported to be worth about £300million. This has caused a lot of anger by current owners’ Tom Hicks and George Gillett. Yesterday evening, an official Liverpool FC statement stated that Hicks and Gillett attempted to remove Managing Director Christian Purslow and Commercial Director Ian Ayre from the Board. This has shown that Gillet and Hicks will fight every battle in order the club is not sold at this price of £300million. The debt owed to Royal Bank of Scotland (RBS) of about £285million has to be paid by October 15th. This will leave Hicks and Gillett with little or no money from the deal. Today Liverpool FC Chairman, Martin Broughton confirmed the deal has been agreed with NESV, but not finalised. The deal still needs ratification from the Premier League but this isn’t the major hurdle that needs crossing. A legal battle from Hicks and Gillett to block the deal will be the major issue that needs resolving if this deal is to go through. I feel this is some good news for us Liverpool fans because at least the club’s ownership is becoming a little clearer. I am happy that this deal is close to going through but am wary that the legal battle from Hicks and Gillett will prevent NESV from completing the deal. I am also sceptical about the finances that NESV will use to purchase the club as I would hate for them to burden the club with debt as Hicks and Gillett did. The main expectations I hope from this deal is that finances will be provided to the manager, and also progress is going to be made on a new stadium. Overall, I feel this is good news; it can only be judged to be great news in the coming years if the club’s finances are healthy and debt-free, and the club is challenging for the major trophies once again! This story will continue to unravel and no doubt there is more news to be released in the coming week…..
On Monday 15th February 2010, the Premier League announced that they are considering a play-off for the final Champions League spot. Currently the top 4 teams qualify for the Champions League competition. The proposal states that the top 3 will automatically qualify, but the 4th place would be decided through a play-off. The play-off would see the teams placed 4th-7th playing against each other in order to decide the final place. I feel this proposal is not needed, because it can be seen that this season the competition for the final Champions League spot has been the fiercest ever. This proposal needs agreement of at least 14 of the 20 Premier League clubs in order to get the go ahead. Also there can be no changes for the next 3 years, because the next TV deal is in place. I feel this deal should not get the go-ahead because each year competition for the Champions League places increases. This season, my beloved Liverpool, Manchester City, Tottenham Hotspur and Aston Villa have a great chance to qualify for the Champions League. Currently, there are 2 points separating the 4 teams. This is sufficient evidence to suggest that competition s increasing, and therefore this play-off is not needed. I hope it does not happen, as I think it will tarnish the prospect and reputation of the Premier League. It will also mean that the so called ‘Mid-Table’ teams in the league have a possibility of playing against the best of other European countries. Therefore, I feel this proposal should not be accepted and hope the traditional system is maintained for the future. On Thursday 11th February, Liverpool FC captain Steven Gerrard met his wax work model at Anfield. Gerrard posed for photographs with the wax work which looks identical to the England midfielder. I feel this is a great milestone in the life of Steven Gerrard. Gerrard has been an inspirational captain for Liverpool, and to see him be created in a wax work model is great. I feel the wax work will show that Gerrard will be recognized amongst the best sportsmen in the world when people visit Madame Tussauds in London. On Tuesday 9th February 2010, there were rumours that insisted Indian billionaires Mukesh Ambani and Subrata Roy were to preparing a takeover bid for Liverpool FC. The rumours suggested they wanted a 51% controlling stake in the club to pay off the £237million debt. These rumours were dismissed by Ambani, and also Liverpool FC has denied making contact. As an avid Liverpool fan I wish we get some new investors soon. The quicker we find investors, the quicker the club can be financially stable. Manager Rafael Benitez has had to sell players to buy new ones in recent times. Therefore if new investors are found, Rafa can invest in the squad freely without the worry of debt. I feel if the Indian billionaires take over the club, it will be good times ahead, and we can put the Hicks and Gillett era behind us. Ambani and Roy are very wealthy businessmen and their investment would be very welcome on Merseyside. I feel an investment deal (if not this one) is close to happening, and hope the club can enjoy a minimized debt future off the field. On Saturday 6th February, Liverpool beat local rivals Everton in the Merseyside derby. Dirk Kuyt’s 55th minute header enabled the Reds to make it 7 unbeaten games, reaching 17 points from a possible 21. I feel this win will begin a surge for the final Champions League spot. This win will ooze confidence into the squad and enable us to keep fighting for 4th place. I feel if this type of performance is maintained until the last game, 4th place will be ours. Dirk Kuyt has taken the role of goal-scorer in recent weeks, and this has boosted our chances. Even though today’s match was not a great spectacle, Liverpool showed great grit and determination to win the game. Therefore I feel today’s performance will enable us to boost our confidence, resulting in us achieving 4th place come May. Our season did not start well, but I feel it will end in the right way, by us achieving our Champions League qualification hopes. With the football transfer window closing today at 5pm GMT, English football clubs have been trying to do their last bit of transfer business of the January transfer window. With many football clubs making last minute buys, the only winners of the past have been the football agents. On Thursday 28th January 2010, Her Majesty’s Revenue and Customs (HMRC), or the taxman to me and you, aimed to tackle the football agents in the tax paid on their fees. According to a report for the Barclays Premier League, clubs spent £70.7m on agents’ fees last season in 803 transactions. This large amount that football agents earn is a staggering amount, when in some cases; little ‘work’ is actually done on each transfer. I think that the HMRC are right to clamp down on the fees that football agents earn. The 40% income tax rate paid by football agents is sufficient but, the taxman needs to clamp down on offshore payments. Tax havens can be very popular for football agents, leading to them not paying any UK tax. Therefore, the HMRC are right to target football agents’ income by investigating their earnings in more detail. Are security fears tainting this summer’s World Cup? In recent weeks, it was announced that in South Africa, locals are selling stab vests in order to protect fans when visiting the World Cup hosts. This has raised eyebrows from fans, football associations and tourists. The stab vests, shown below, conveys the St. George’s flag and aims to protect the user from stabs, cuts, slashes and blows from sharp items. As South Africa has a high crime rate, it increases doubts from England fans, and supporters all over the globe, whether to attend this summer’s event. I think people should listen to the advice of the Football Associations and local police on how to act in South Africa. Events in Angola have raised fears in Africa’s security and whether it can hold a safe and successful World Cup. I am sure this summer’s event will incur minimal crime and controversy. South Africa’s image should be feared and I am confident a great summer of football is in prospect. On Friday 22nd January, Sunderland boss Steve Bruce launched a scathing attack on Liverpool following their pursuit of Kenwyne Jones. There was no need to verbally attack Liverpool, because of their interest Kenwyne Jones. Liverpool have not officially announced their interest in Kenwyne Jones, so Bruce’s outburst was not needed! Bruce went on to say that Liverpool wanted Jones on loan, and comparing that with Sunderland wanting Steven Gerrard. This shows no logic, only weakness in Bruce’s attitude. Bruce should have spoke to Liverpool privately about the issue, and not gone public with this attack. I think Liverpool have not done anything wrong, and have not publicly declared their interest in Kenwyne Jones. Bruce should have thought about his outburst, because he could be in the same position in the future. Do we need Asian Football Leagues? Should Asian Football Leagues exist when we have other leagues? Whilst listening to Nihal’s show on BBC Asian Network today, there was a debate about whether there should be Asian Football Leagues. There are other football leagues out there so why do we need Asian football leagues? I feel that Asian Football Leagues can bring a community together but if there is talent, then I think that they should try and play for a team that is not restricted to Asians. During the show, a caller said that her brother played for an Asian team first then played for Birmingham City’s youth team, and now plays for Walsall’s reserves. I feel that Asians can play in the mainstream football leagues and do not need to play for an Asian team, because they should be judged on talent not on race. I also feel that more football scouts should visit the Asian Football Leagues in order to see if there is talent out there. I shouldn’t matter what race you are in order to play football. I think that if a player is good enough to play for a big team, they should be able to, and their ethnicity should not be a barrier. This should help kick racism out of football!